Here is the process that I use for attaching a single Mono-loop weedguarad to a bass bug hook. 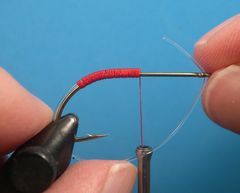 Attach 6/0 Uni Thread to the hook at the hook's point and lay down a solid base of thread partially down the hook's bend than back to the point where you want the deer hair body to begin. On most bass bug hooks that would be about 3/16" forward of the hook's point as shown in the photo. Select a piece of Mason Hard Mono for the weedguard. 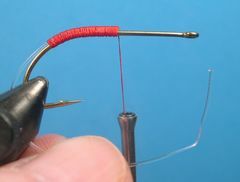 The mono should be approximately the same thickness as the hook's shank. Almost all of my deer hair bugs are tied on Mustad 3366 Bass Bug Hooks. Here are the hook sizes and the Mason mono I use on them. Align the piece of mono on top of the thread wraps with the tip of the mono flush with the front of the wraps. 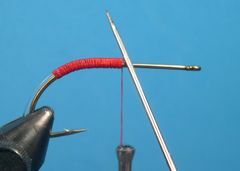 Bind the mono to the top of the hook's shank covering the mono and the shank with tight wraps of thread as shown. Finally, paint the thread wraps with a coat of thinned Dave's Flexament. Before we move on to sizing the weedguard I would like to explain why I attach the weedguard this way. First, if the front of the weedguard is strategiaclly placed on the shank it will be very easy to determine where the head or body will be, where the tailing materials should be placed, and where the skirt will be. The front of the weedguard acts as a backstop for the deer hair when it is being spun, stacked, and packed on the hook's shank. The weed guard prevents the hair from being pushed back over the tailing materials as the deer hair is tightly packed. 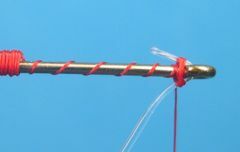 The tailing materials are always tied down from the front of the weedguard back to the hook's point. The guard provides a flat shoulder to tie on the feather wings or legs. Without that flat shoulder, feathers and other materials tend to roll on the shank. Finally, the collar or skirt is tied in between the base of the tail and the front of the weedguard. The bare hook shank in front of the weedguard is where the deer hair head/body will be built. But, before you tie in the tail and the skirt and build the deer hair body, you should finish sizing the weedguard so you won't have to do that when the deer hair body is in the way. 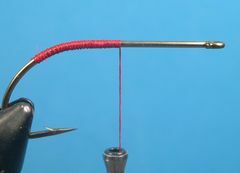 First, insert the tag end of the mono loop through the hook's eye and bring it up to a point where the bottom of the loop is below the hook's point by about on-half of the width of the hook's gape. 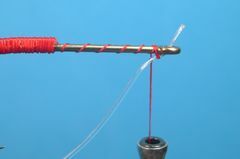 While holding the loop in place with your left hand, crimp the Mono with the thumb and index finger of your right hand. Flatten the crimp in the Mono with a pair of needle nose pliers.When you tie of the Mono guard later, the flattend crimp will let you know exactly where to tie it off. Now you are ready to tie in the tail, the skirt, and the head. You won't be tying off the guard until after the hair bug has been trimmed. In this photo we are assuming that all of the other materials have been applied to the hook and it's now time to tie off the weedguard. Here is how you do it. First, the tying thread should be hanging at the front of the trimmed deer hair head/body. Next, insert the tag end of the Mono guard through the hook's eye as shown and take two or three snug wraps of thread around the guard. Move the guard back so that the kink in the Mono is in the hook's eye. 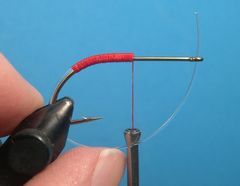 Then trim the tip of the Mono flush with the front of the hook's eye as shown. 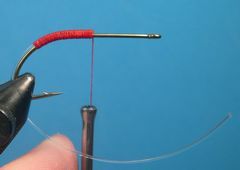 Bring the tying thread up and catch the tip of the mono and bind it down to the hook's shank with several tight wraps while building a neat thread head in the process. 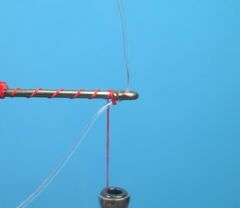 Tie off the thread with a whip finish or a couple of half-hitches and the weedguard is tied in.